It's been a while since I last updated you about the Main Menu that will be available in Better The Demon for players, and so I thought I would post this week about it again. Before I do, however, I can report that this week I have been writing more conversations and correcting code to expand possibilities for player's actions. Wherever possible, I have tried to keep the responses "real" according to NPC motivations and subject to the PC's skills at bluffing, intimidating or using diplomacy. The code correction I mention related to monster drops and now differentiates between bounty item drops and alchemical distillable item drops. The difference being, the former items are always recoverable, whereas the latter items require ranks in the alchemy skill to have any chance of recovering. The Main Menu is a GUI that the player uses to play extra mechanics for their PCs in Better The Demon. It can be used as little or as much as the player wants to. It is activated by clicking on the Main Menu button (a newly added feat on entering the game) that has been moved to the quick slots for easier access. (See screenshot.) The Main Menu cannot be accessed during combat. From the same screenshot, you can also see two other newly added feats/buttons to do with game play in Better The Demon: The Sorry button (used to pacify hostile NPCs who have reacted to a PC attacking them) and the Auto Pause button, used to turn play into a simulated turn-based combat mode, which pauses every six seconds allowing players to determine their PCs actions ahead of time and at a more leisurely pace. Basic Information: For those who will have seen the last version of the Main Menu, they will see there have been a few changes. First, the menu now has four tabs (this screenshot is currently on the first tab, Basic Information). The renaming of a weapon was incorporated into the new Rename Equipment tab. Secondly, a new combat Auto-Pause option has been added to allow a party of PCs to be automatically paused (and placed into turn-based combat) if attacked and the option is on. Other changes include a Session Time and Total Time for players to note how long they have been playing the module. This page also has the Map Pin buttons and Game Test buttons (when a test is available) and shows the PC's current Vigour level, as well as the Current Game Date. Improve Dead Weapon: The third tab relates to a new system used in the Better The Demon: Some weapons, called Dead Weapons, can deteriorate with use. Such weapons can either be maintained by a blacksmith (or PC member with the appropriate skill) at a repair workbench, or, if in the field and far from a workbench, by the use of sacrificing a Life Essence. 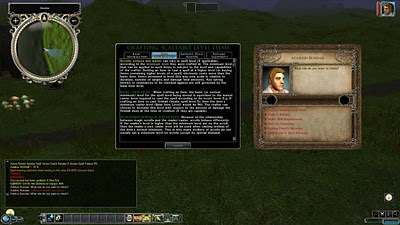 This function of the Main Menu is where the player can use their PC to repair a Dead Weapon using any Life Essences they might carry. Rename Equipped Items: The fourth and final tab is used to rename items that the PC can equip. Only items that the PC can equip (and is not stolen) can be renamed. This is just a simple interface to allow players to help personalise their equipment. If you have any questions or comments you would like to raise about this interface, then please do. Furthermore, if you have any questions about any of the other systems Better The Demon will use, then please let me know in a comment as well. A reminder ... if you haven't voted in the poll yet (on the left hand side), then please do and feel free to comment. Also, are there some weapons that cannot be renamed? I mean, if I found 'Sting' or 'Glamdring', would I be able to rename them too? As for naming items, the only items I have made that cannot be renamed are stolen items at the moment. It could be possible to restrict special weapons, but I decided that the player can choose whether they want to call it something else or not. And I suppose that just because a player may rename a weapon "Sharp Blade" does not stop someone else (an NPC) from recognising it as "Sting" for instance.